The Cloud Native Computing Foundation (CNCF), the open source group that’s also the home of the popular Kubernetes container management system, today announced that it has added Linkerd as its fifth hosted project. Linkerd (pronounced linker-DEE), which was incubated at Buoyant, follows in the footsteps of other CNCF projects like Kubernetes, Prometheus, OpenTracing and Fluentd. Linkerd’s role in all of this is offer a so-called “service mesh” to these modern, generally container-centric, applications. Linkerd is a standalone proxy that, at its core, enables the different services to communicate with each other. “So rather than service A talking to service B directly, service A would talk through a Linkerd instance (and if we do our jobs right, service A doesn’t actually have to know that it’s going through Linkerd),” Buoyant CEO and co-founder William Morgan, who previously worked on similar problems at Twitter, explained to me. “And in practice, you’d deploy tens, hundreds, or thousands of Linkerd instances, and they’d form a ‘mesh’ of resilient communication.” So just like the kind of proxies you’re already familiar with (think Nginx for handling web traffic), Linkerd offers similar features for internal traffic. Morgan argues that this is becoming especially important now that modern applications often don’t just call a few different service (web server -> app -> database), but maybe a dozen microservices. ” Our fundamental belief is that, in this world of modern application architectures, the requirement for resilient applications becomes a requirement for resilient service communication,” Morgan said. 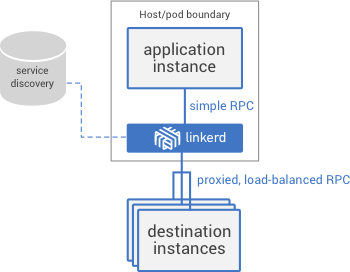 Besides forming a language-agnostic messaging layer, Linkerd also offers load balancing, failure and latency handling and other services that all aim to keep microservice-based applications responsive. Buoyant has raised about $3.5 million so far. Linkerd is its flagship open-source tools, but its main focus is Helium, a service that promises to give enterprises insights and control over their cloud-native applications. Why did the company donate Linkerd to the CNCF? Morgan told me that the kind of companies that are most likely to get value out of the project are exactly those that are already trying to run “cloud native” environments. “Also, and this was really important to us, as a startup that is trying to balance a) having an open source project that provides concrete value, has a thriving community, and is viable as a standalone product (i.e. doesn’t feel like crippleware); while also b) building a business that can be profitable, can attract top talent, and can solve critical infrastructure issues for other companies — the CNCF is very open to this duality and, like us, believes that you can do both, and you can do both well,” Morgan added.